Sure there are workarounds, and once you understand the root cause of the issue they are easy to find. 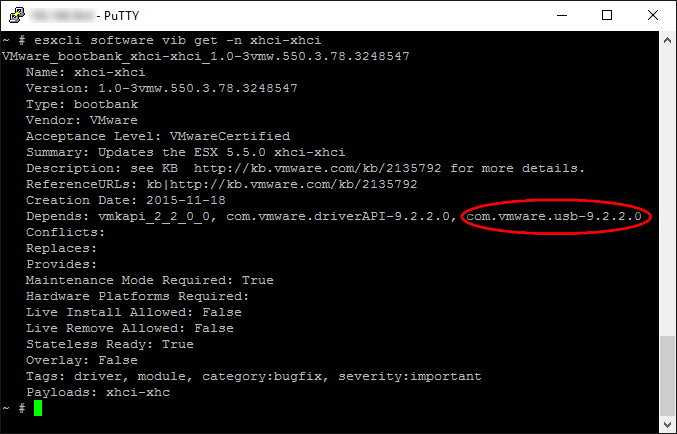 With ESXi 5.5 Update 3b the xhci-xhci VIB that is mentioned in the error message was updated to version 1.0-3vmw.550.3.78.3248547 (extending USB 3.0 support), but in ESXi 6.0 the version number of this package currently is 1.0-2vmw.600.1.17.3029758. Version strings are interpreted from left to right, so the package included in the ESXi 5.5 Update 3b ImageProfile (version 1.0-3...) is considered newer than the ones included in any of the ESXi 6.0 ImageProfiles (version 1.0-2...). This is an unusual exception, but not the only one of its kind: Since Update 3 ESXi 5.5 also includes a net-e1000e driver package of version 3.2.2.1-2... (which adds support for Intel Jacksonville NICs) whereas ESXi 6.0 still includes an older version 2.5.4-6... of this package. But this does not cause the same update issue. Why? 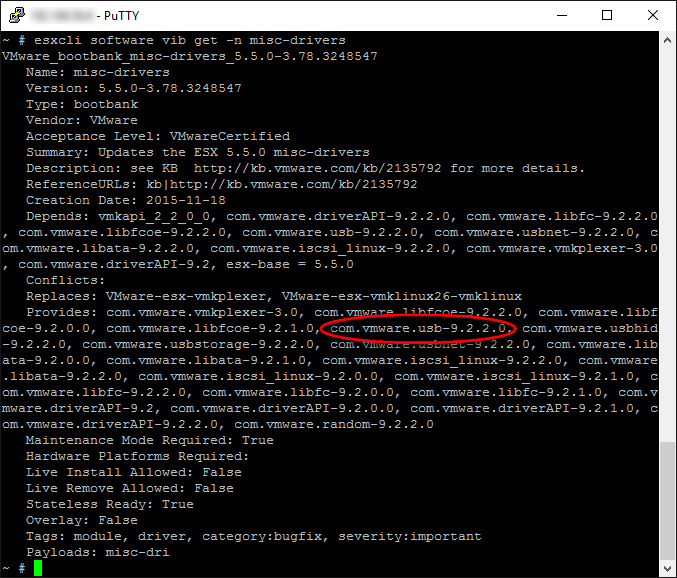 Here we see that the xhci-xhci VIB (version 1.0-3) is dependent on the feature com.vmware.usb-9.2.2.0 which is mentioned in the error message. The misc-drivers package of ESXi 6.0 provides the feature com.vmware.usb-9.2.3.0, but not the feature com.vmware.usb-9.2.2.0 which is required by the latest xhci-xhci v1.0-3 package. 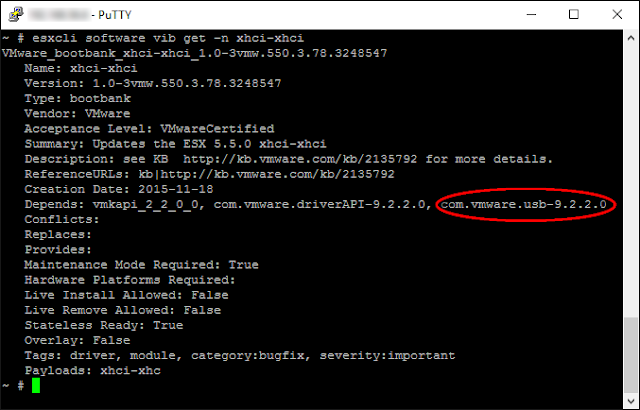 The esxupdate process wants to keep the latest xhci-xhci package that comes with ESXi 5.5, but its requirement com.vmware.usb-9.2.2.0 cannot be satisfied with the ESXi 6.0 Imageprofile. Thus the update fails. Normally this requires a reboot, but I found that updating the system with the esxcli software profile update method is successful immediately after the package removal without a prior reboot. VUM though requires the reboot to be performed before you try the remediation again. 2. The alternative is to wait ... until VMware releases a new ESXi 6.0 patch bundle that (hopefully) includes an updated version of the xhci-xhci package that has a later version number than the one included in ESXi 5.5 Update 3b. Updating to this newer ESXi 6.0 patch will then succeed without any workaround needed. With this new QA glitch VMware has seriously messed up the upgrade experience for a lot of their customers :-( I hope that they add a new test case for ESXi patch bundles very soon. It could be as simple as For earlier releases of ESXi check if an upgrade to the current release can be performed without errors. Improve communications ... it looks like there are different teams working on ESXi 5.5 and 6.0. Maybe they need to talk more to each other. And maybe they also need to re-think their package versioning standard or make it more consistent at least. And a question at last: Why are functional enhancements like better USB 3.0 and new NIC support added into ESXi 5.5 first, and not into the current ESXi release 6.0? What does VMware consider the stable code base? Thank you! I went to upgrade my hosts today from 5.5U3 to 6.0U1 using the custom HP ISO I downloaded a few days ago to prepare for this. The error during install freaked me out! It took me a bit of Googling to find your post, but this was immensely helpful. HP has an updated custom ISO for 6.0U1b on the VMware download site, so I grabbed that and it worked great. Thanks for doing a write up on this because I was stuck with the same error preventing me from upgrading to 6. Thank you! Thank you for the detailed write up, I wish the VMware kb went into as much detail rather than just telling to remove it. VIB VMware_bootbank_ehci-ehci-hcd_1.0-4vmw.600.3.69.5572656 requires com.vmware.usb-9.2.3.0, but the requirement cannot be satisfied within the ImageProfile.